The great thing about road trips is that getting there can be half the fun. Such was the case yesterday when we traveled across the Trans-Canada Highway (Highway 1) from Kamloops to Banff. Not only did we get some great windshield views, but we also found a nicely accessible boardwalk trail. And that’s something that wouldn’t have happened if we weren’t driving. We picked up a few sandwiches to serve as our picnic lunch; and although we had planned to eat them at the Redgrave Rest area, we didn’t quite make it that far. Just after we entered Revelstoke National Park I found a nice little picnic area adjacent to a park information kiosk, so we pulled off the highway and chowed down. After lunch we looked at the information kiosk and discovered that there were a number of boardwalks along the route. Although most of them weren’t accessible, one had that nice blue wheelchair logo beside it, so we decided to head up the road to Hemlock Grove Boardwalk. And we weren’t disappointed. 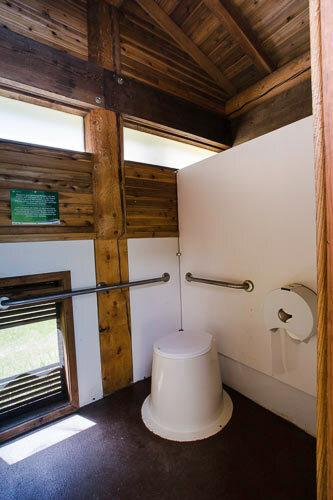 Accessible pit toilets at Hemlock Grove Boardwalk. Although there weren’t any accessible parking spaces in the parking lot, all of the spaces were oversized and there weren’t very many people there. The good news was there was an accessible pit toilet in the parking lot. They really are accessible -- and clean too! 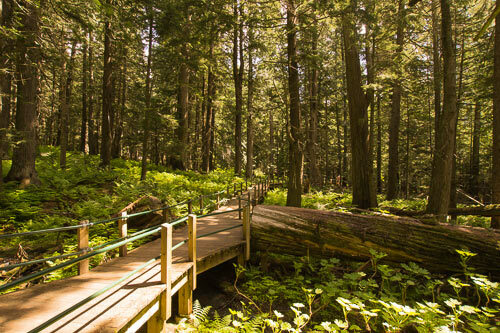 The boardwalk itself is about a quarter-mile loop through a hemlock grove, dotted with ferns and streams. Although you’re just a short way off the main road, you really feel like you’re surrounded by nature (which you are). There are also accessible picnic tables there – covered and uncovered – and if I knew about them beforehand, I’d of held out for our lunch stop. All in all it was a very pleasant distraction along a scenic route through Western Canada. A word of warning though – take the loop counter-clockwise as the left entrance is a bit steep. You might even want to do the full loop and go all the way back to the right entrance, as it has a gradual rise to it. 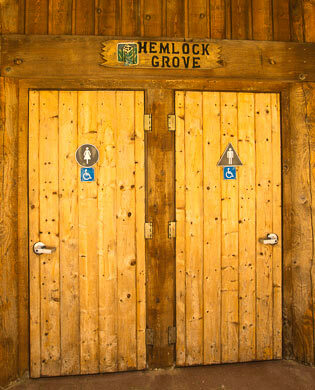 So if you’re in the neighborhood, do take time to stop at Hemlock Grove. You won’t be disappointed – I guarantee! This entry was posted in Attractions, Recreation, Road Trips, Uncategorized and tagged accessible travel, barrier-free, boardwalk, Canada, disabled, Glacier National Park, Grove, Hemlock, slow walkers, travel, wheelchair by Candy B. Harrington. Bookmark the permalink.